Yes, that's a big problem in Chile. We should get rid of them all. Nobody has the courage to kill them all. There are even some that protect those dogs. Location: Shadows, illusion, fantasy, reflections in mirrors. O my Sheikh, my true Sheikh! Is your order to us to slaughter all dogs? May you have all good and success in this life and the next. "The color of the water depends on the color of its container. People cannot know it, until they have a taste of it. Every thing is reflected in it, without veiling, without defect." yamantako wrote: Is your order to us to slaughter all dogs? yamantako wrote: O my Sheikh, my true Sheikh! If you want them alive, Patagoniax and me can collect them for you, and leave them at your home. Not problem. May you live happy, crowded by half a million street dogs. "Patagoniax and me?" So, I have two Sheikhs? I am more than happy. May my Sheikhs always prosper. Killing them is not the answer. 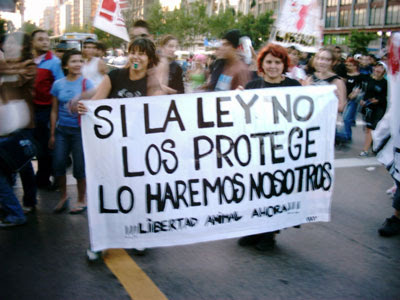 The Chilean resistance to neutering/spaying must be addressed. If they were caught, fixed, and returned to the street, the problem would eventually and less violently diminish. Might work for some irresponsible people as well. As the owner of a former street dog (many), I need to come to their defense a bit. 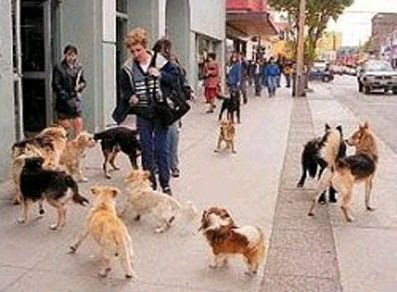 The problem is not that there are street dogs. There are street dogs in every country in the world (even where they tend to eat them). The problem is the lack of laws to regulate dogs, dog ownership, licensing, vaccinations, and so on. Put a 200,000 peso fine on not having your dog vaccinated, or letting it wonder around free. How about 200,000 peso license fee to have a dog not fixed after 1 year old. Breeders can still breed pure breads, but it will cost them to have an unfixed animal. so on, and so forth. How about bonuses for people that adopt and take care of street dogs? The people are the problem. The dogs are just being dogs. This is from a guy that has been chased by a pack of street dogs. I don't really hold it against the dogs. I have to hand it to the government spokes person. The morning of the attack she was out front of the Moneda defending street dogs and talking about her own adopted street dog. What would Chilean Muslims say? Dogs are mentioned in the book of Islam the Quran several times e.g. in sura 18 where a dog is a companion of the dwellers of the Cave. The Quran also tells that it is permissible to eat what trained dogs catch (5:4). Nevertheless, many Islamic teachers state dogs should be considered unclean and that Muslims licked by them must perform purification. According to a Sunni Islam Hadith, a plate that a dog has used for feeding must be washed seven times, including once with clean sand mixed with the water, before a person may eat from it. According to the majority of Sunni scholars, dogs can be owned by farmers, hunters, and shepherds, for the purpose of hunting and guarding. Another exception appears to be made by the Bedouin in the case of the Saluki. They are allowed in the tents and considered special companions. patagoniax wrote: What does Yamantako/Rune suggest as a way of dealing with the health/safety problem of legions of vicious loose dogs? Something perhaps more prescriptive than philosophical. http://en.wikipedia.org/wiki/Dog_meat wrote: Dog meat (Chinese: 狗肉; pinyin: gǒu ròu) has been a source of food in some areas of China from at least around 500 BC, and possibly even before. Mencius, the philosopher, recommended dog meat because of its pharmaceutical properties. Ancient writings from the Zhou Dynasty referred to the "three beasts" (which were bred for food), comprising pig, goat, and dog. Dog meat is sometimes euphemistically called "fragrant meat" (香肉 xiāng ròu) or "mutton of the earth" (地羊 dì yáng) in Mandarin Chinese and "3-6 fragrant meat" (traditional Chinese: 三六香肉; Cantonese Yale: sàam luhk hèung yuhk) in Cantonese (3 plus 6 is 9 and the words "nine" and "dog" are homophones, both pronounced gáu in Cantonese. In Mandarin, "nine" and "dog" are pronounced differently). The eating of dog meat China dates back thousands of years. Dog meat has long been thought by some to have medicinal properties, and is especially popular in winter months as it is believed to generate heat and promote bodily warmth. Also, dogs have occasionally been eaten as an emergency food supply. I have to agree with admin on this, problem is not the dogs but the strange Chilean attitude/inhibition with regards to spaying and neutering pets. Like many things in Chile, the life of these dogs is romanticized and the ugly reality ignored. Why bother with the problem when poetry de perros vagos will suffice? Alert the Nobel Committee!